The national debt of Lithuania is the debt accumulated by all levels of government in the country. Not all public sector debt is counted as part of the national debt. The money borrowed by state-owned enterprises and agencies is not included. 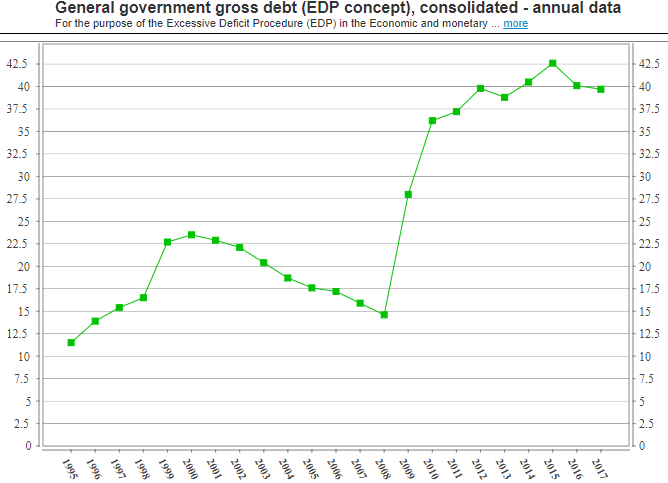 Only debts created by the government through formal debt agreements are included in Lithuania’s national debt figure. The debts represented by invoices to the government that are as yet unpaid are not counted as part of the national debt. Obligations to future pension payments aren’t counted as part of the national debt. Guarantees given by the government to underwrite loans taken out by other institutions are counted by some monitoring bodies and not by others, while some economic institutions only count certain loan guarantees given by the Lithuanian government. The three key international bodies that monitor the economy of Lithuania are Eurostat, the International Monetary Fund (IMF), and the Organization for Economic Cooperation and Development (OECD). Each of these institutions uses a different methodology to measure the national debt. As a member of the EU since 2004, the government of Lithuania has to implement the standards of economic measurements that are mandated in the Maastricht Treaty. Eurostat uses the same standards. The IMF and the OECD have different accounting standards to Eurostat. One of the main difference is the inclusion of guarantees to other institutions. Eurostat counts the guarantees given by the Lithuanian government to EU institutions, such as the European Financial Stability Fund. The IMF doesn’t count the guarantees, but the OECD does. In fact the IMF doesn’t count any government guarantees in its calculations of the national debt figue and the OECD counts all guarantees pledge by the government, not just those to EU institutions. Economists are interested in the income of a country alongside its debt. The annual national income is called the Gross Domestic Product, or “GDP.” This economic factor is usually bound into the expression of national debt. Debt is monitored as a proportion of the nation’s GDP and the debt to GDP ratio is the most common form of debt statistic and it is expressed as a percentage. The inclusion or exclusion of bank guarantees is not the only reason for the differences in the nation debt reports of these three institutions. Face value means the amount written on the bond or Treasury bill. This is the amount that the government is expect to repay on the maturity date in the case of fixed-value bonds. The nominal value is usually the ale as the face value, except in the case of index-linked bonds. When the redemption value of a bond increases with inflation, or in line with some other index, the nominal amount increases and is different to the face value. Many traders are willing to pay more that the face value of the bond in order to have a safe storage for money. This creases a market value, which is usually higher than the face value or the nominal value. If the government of Lithuania attempted to buy back its bonds on the market today, it would have to pay the market value and not the face value. The debt figures for a country will be different depending on which of these valuation methods is used in the calculation method. The IMF and the OECD use market values when calculating the debt to GDP ratio of Lithuania, but Eurostat and the government of Lithuania use the nominal value. As Lithuania doesn’t issue index-linked securities, the nominal values of government securities is the same as their face values. When you read a national debt figure, be careful to check whether it refers to gross debt or net debt. Gross national debt expresses all of the debts of a country as explained above. Net national debt is produced by deducting the value of all of the financial assets owned by a government from the gross debt figure. Net debt is always lower than the gross debt amount. Like gross debt, net national debt is expressed as a debt to GDP ratio. The IMF calculates Lithuania’s net national debt for 2017 as 29.7% of GDP. This compares to the IMF gross debt figure for Lithuania of 36.5%. After gaining independence from the Soviet Union in 1990, the economy of Lithuania experienced rapid growth. This momentum was increased when the country joined the EU in 2004. A sudden flood of investment capital and a switch from Communism to consumerism and capitalism created a boom in credit fueling trade deficits and a housing boom. Large private sector debts and a property price bubble exposed the economy to the global liquidity crisis of 2008.Property values collapsed, banks stopped lending, many businesses went bankrupt, and the economy retracted sharply. This effect can be seen in the graph below from the OECD. The country’s gross debt has always been low by European standards. Eurostat started monitoring the Lithuanian economy in 1995, when it measured the nation’s debt to GDP ratio as 11.5%. When the country joined the EU, it’s national debt was well below the Maastricht Treaty requirement of a debt to GDP ratio of no more than 60%. 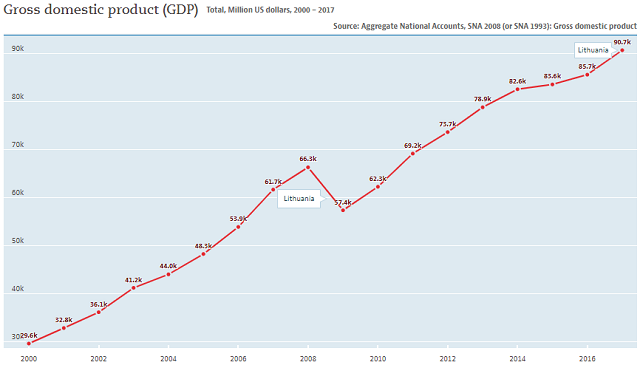 By 2008, Lithuania’s national debt stood at 14.6% of GDP. The fall in GDP coupled with the government’s efforts to inject new liquidity into the economy saw the country’ national debt rise to 28% in 2009 and 36.2% in 2010. The rise in national debt peaked in 2015 at 42.6% of GDP. Since 2015, the government has been able to bring down the national debt. 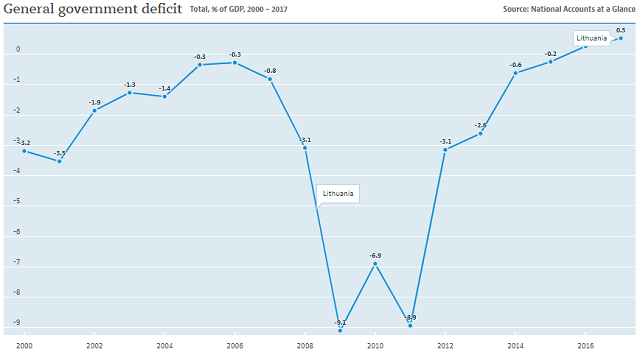 The Lithuanian government ran very large budget deficits for three years in order to boost GDP growth. The large budget deficit reduced every year since 2011 and now the government runs a small surplus. What is Lithuania’s credit rating? Lithuania has a credit rating in the “A” category. Although the county does not have the best credit rating available, which is “AAA,” it dos better than many other countries in Europe. The country’s A-level credit rating shows that the international trader community is confident that the government has repaired the damage caused by the 2008 crisis. Who manages Lithuania’s national debt? The Lithuanian government’s Ministry of Finance is responsible for setting the national budget every year. Deficits in the national budget create the national debt.The ultimate borrowers are the taxpayers of the county, and so their representatives in parliament have to approve the government’s budget. How does the Lithuanian government raise loans? The Ministry of Finance issues new government securities within the country through auctions. Only approved institutions can bid in the auction. This process is called “the primary market.” The primary dealers are market makers and they resell their allocations on the secondary market where anyone can buy those government securities. The regular government bonds are listed on the Vilnius stock exchange. Traditionally, the government of Lithuania issued Treasury bills to fund short-term financing needs. However, there have not been any new issues of these bills since 2015. Lithuanian government bonds offer a fixed interest rate. Instruments currently in circulation in the secondary markets have maturities of 3, 5, 7, and 10 years. The government of Lithuania also raises money abroad through a Euro Medium-term Notes program. These variations on bonds are governed by English law and are denominated in Euros or US Dollars. The Lithuanian EMTNs have maturities of 10 years and are registered for trading on the Luxembourg bourse. What facts should you know about Lithuania's national debt? You could wrap $1 bills around the Earth 77 times with the debt amount. If you lay $1 bills on top of each other they would make a pile 2,151 km, or 1,337 miles high.